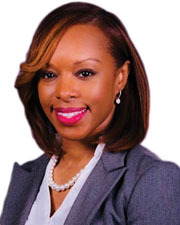 2018 Women In Real Estate, Professional Services: Crystal Young, Suris & Associates, P.C. Company Name: Suris & Associates, P.C. The last year has been a period of learning and advancement. I have traveled all over Long Island and New York City to hold seminars for first-time home buyers. Through this work, I am able to outline (and simplify) what can be an overwhelming process for potential buyers of residential property. It has been amazing gift to be a part of the process, as a new homeowner closes on the home of their dreams. Additionally, this year, I have taught real estate agents how to understand real estate contracts at many of New York state’s largest real estate companies. Mel Robbins is a woman who greets each day with a fresh mentality and takes on any challenge head on. Reading her book, The Five Second Rule, has encouraged me to be better than my excuses and bigger than my fears. Other influencers who have helped me in my career are Oprah Winfrey, through her Facebook live feed, “Super Soul Sunday” and Iyanla Vanzant, both of whom are women that encourage individuals to live their best life. It is essential for women to create a personal brand. Creating a brand allows women to form relationships by introducing themselves and their work, prior to a formal face-to-face introduction. Effective personal branding speaks for itself. No explanation required. Staying organized is one of the most important aspects in being a successful real estate attorney. Keeping a neat and orderly inbox is imperative to staying on task and meeting the needs of my clients. Generally, I receive approximately 100 emails per day, and make it a point to respond within 24 hours of receipt. Once I read and respond to an email, I move it into a subfolder for future reference. I believe this to the most effective way to manage daily emails. Any activity which incorporates family and friends.